New Cherry 15 Amp, 125 Volt / 250 Volt, Normally Open, Button Type MicroSwitches, Part Number 0E1324EC, Item Number 0E1349EC. E13 P CHINA. E13 SERIES. 15A 125 or 250 VAC. These are nice sturdy switches for a multitude of applications. Switch N.C. Cherry 0E1324EC 3394881. 125 VAC or 250 VAC 15 AMP. 3/4 HP 125 VAC 1-1/2 HP 250 VAC. Quality Cherry. Normally Closed Switch. 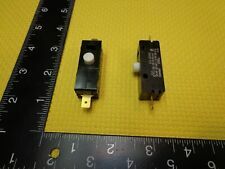 HONEYWELL S&C V7-1C17D8-048 Microswitch, Miniature, Hinge Lever, SPDT, Quick Connect, 15 A, 250 VAC/250VDC. The MICRO SWITCH™ V7 series premium basic switch is used for simple or precision ON/OFF, end of limit, presence/absence and manual operator interface application needs. Up for sale is a NEW HONEYWELL Micro Switch LSA1A Heavy Duty Limit Switch 10A 600VAC. Inventory # 133-J4-Y. Panasonic SPDT Hinge Lever Microswitch, 3 A @ 250 V ac. 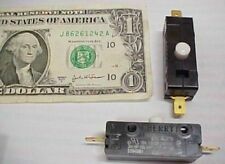 1 x Honeywell Leaf Lever Microswitch, 16 Amp 250 Volt AC SPDT NO/NC. 1 x Saia-Burgess V3SYR1-UL IP-67 SPCO Roller Lever Microswitch, 5A@ 250V AC. It is rated for 11A at 125/250/277VAC, 1/3HP, 1/2A at 125VDC and 1/4A at 250VDC. There is a 3/4" lever with a plastic boot on it. 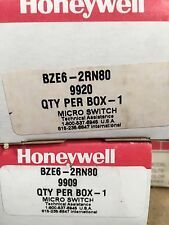 Honeywell part number V7-7B19D8-426. 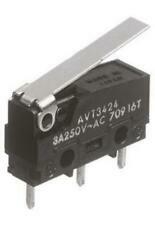 Microswitch SPDT Rated 11A @ 125/250/277VAC V7-7B19D8-426. IP66 Snap Action Limit Switch, Plunger, Die Cast Zinc, NO/NC, 600V. Actuator Type Hinge Lever. Connection: Spade cable shoes 6.3´0.8 mm. 189157: although 4.8´0.5 mm. Case Material Glass Fibre Reinforced Nylon. Release Force 0.07N. Switch type: Switch SPDT. Bremas ERSCE. M4 Series Microswitch. M4-04-NO NC. Designed & Made In Italy. First Positive. New Cherry 15 Amp, 125 Volt / 250 Volt, Normally Closed, Button Type MicroSwitches, Part Number 0E1324EC, Item Number P0E1324EC. 15A 125 or 250 VAC. These are nice sturdy switches for a multitude of applications. Type of switch microswitch SNAP ACTION. Switches features without lever. Snap Action Roller Microswitch. Actuator : Roller Lever. Switch Function : ON - (OFF), OFF - (ON). Our pictures will normally show everything that is present with the item listed. If it is not pictured, it is most likely. Microswitch SNAP ACTION; with lever; SPDT; 5A/250VAC; OFF-(ON). Type of switch microswitch SNAP ACTION. Switches features with lever. Lever length 19mm. Series: BZ Series. Manufacturer: Honeywell. Actuator Type: Lever. Type: Basic. Mounting Hole Size: 0.14 ". Length 3" Width 5/8" Height 1 1/2". New- Removed From Factory Bulk Box. Part #: BZ-2RW80-A2. Type of switch microswitch SNAP ACTION. Key stroke 0.5mm. Switches features without lever. insulation resistance 100M?. Electrical life 10000cycles. Type of switch microswitch SNAP ACTION. Key stroke 0.5mm. Switches features without lever. insulation resistance 100M?. Type of switch microswitch SNAP ACTION. Actuator material steel. Key stroke 0.5mm. Switches features with lever. Lever length 10.8mm. insulation resistance 100M?. Each item is hand inspected and/or tested before it is listed for sale. Protection type: IP40. This is an illuminated version. Switch type: Pushbutton switch. Light colour: Red. Switching current (max.). L x W 21 x 15mm. Switch position: 1 x On/Off. Switch features: protuding. Insulation resistance: â¥ 50000 MÎ©. 7 operations. Manufacturer: PHILMORE. Their Datak line includes dry transfer products, wire markers and printed circuit making products. Part Number: 30-1318. Type of switch microswitch SNAP ACTION. Switches features with lever (with roller). Lever length 15.2mm. Type of switch microswitch SNAP ACTION. Switches features without lever. Button shape mushroom. Type of switch microswitch SNAP ACTION. Switches features with lever (with roller). Lever length 26.2mm. Microswitch SNAP ACTION; SPDT; 5A/250VAC; ON-(ON); Positions:2. Type of switch microswitch SNAP ACTION. Number of positions 2. Stable positions number 1-position. Key stroke 2.2mm. Microswitch SNAP ACTION; without lever; SPDT; 5A/250VAC; ON-(ON). Type of switch microswitch SNAP ACTION. Key stroke 2.2mm. Switches features without lever. DIY fashion accessories by Simplicity. Round magnetic buttons combine with your favorite gemstones to create exciting accents for any outfit. Glue gemstones onto magnets & let dry. DIY fashion accessories by Simplicity. HONEYWELL 5PA2 Snap Switch Terminal Enclosure,Plastic FREE SHIPPING!! !